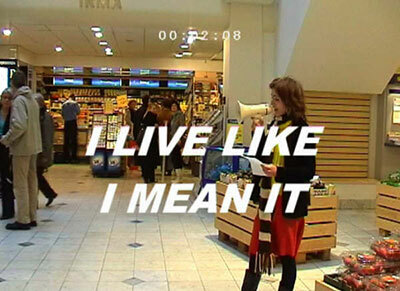 This work is an account of a performance where the artist recites slightly altered commercial slogans in a Copenhagen department store. The film exposes the power positions in the guarded rules of interaction between sellers and buyers. A power position that doesn´t allow you to question the truth or the logic of the slogans. Dealing with a wide range of topics such as tv broadcating, global heating and personal branding Rosa Marie Frang always uses her work to examine and testing the basic values of contemporary society. Questioning the possibilityes of freedom, honesty og independence in a capitalistic society she works with film, sound, graphic design and drawing. Rosa has studied at The Royal Danish School of Architecture, The Funen Art Academy in Denmark and will in 2008 graduate from Umeaa Art Academy in Sweden. She was born 1975 in Hørdum and lives and works in Copehagen Denmark and Umeaa Sweden. Her work has previously been exhibited in Ireland, the Netherlands, Sweden, Romania, Denmark, Germany and Scotland.